Money back Guarantee – The cost calculation we create for you is absolutely free. The fees quoted are fixed. This means that you will incur no extra costs. If it should happen, nevertheless, sometimes that you pay more in Istanbul than given in the costing calculation provided by us, we will refund you the difference – immediately after your return, directly into your account. * If you find an identical travel offer on the day of booking with us, with an online travel agency offering a lower-price, we will refund the difference. *If The reservation in CEVAHIR Hotel is not available, We are forced to book you in another 4-star hotel. Is the growth of transplanted guaranteed process? 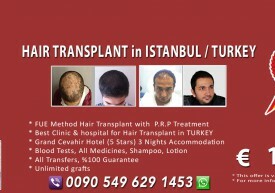 Will Second Hair Transplant Session be Different than First Session?